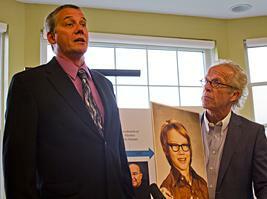 Edward Bramlage, left, is the second person to file a lawsuit under the Child Victims Act. He's being represented by attorney Jeff Anderson, right. WAITE PARK, Minn. — The second lawsuit under the new Child Victims Act was filed Wednesday in Stearns County District Court. At a news conference announcing the suit, Edward Bramlage alleged he was sexually abused by Father Gilbert Allen Tarlton while attending St. John's Preparatory Academy in Collegeville, Minn.
"The reason that I decided to step up was because I couldn't at 14 [years old]," Bramlage said. "In 1977 when I was going to school there, nobody had ever heard of a priest molesting a child, especially men, and I didn't think anybody would believe me." In addition to Tarlton, who is now in his 80s, the suit names the school, the Order of St. Benedict and St. John's Abbey. Bramlage's attorney Jeff Anderson said the new law provides an opportunity for victims of older cases to come forward. "The law now permits three years for any survivor to come forward to sue his or her individual offender and any institution, employer or entity that was negligent in permitting it to occur, that shares responsibility," Anderson said. A statement from St. John's Abbey read that the allegations against Tarlton are being reviewed, and notes the difficulty of recounting facts dating back to 1977. It also read that Tarlton lives in a "restricted environment, under close supervision" and that he does not have contact with the students.